UNITED NATIONS, April 9 -- Months after the UN Security Council voted to authorize 3000 more peacekeepers for the Democratic Republic on the Congo, still none have arrived. Recent a senior UN official told Inner City Press, speaking on condition of anonymity, that India has threatened to pull out the troops it has in the UN Mission in Congo, MONUC. On April 9, Inner City Press asked MONUC chief Alan Doss if India has filed a communication with the UN about withdrawing from the Congo, and separately if India was even asked to be a part of the 3000 authorized reinforcements. Tellingly, Doss did not deny India's threat, and did not answer if India was ever considered for the additional 3000 troops. Doss said that Congo's foreign minister attended a meeting hosted by the Indians when Secretary General Ban Ki-moon recently visited the Congo, "but the discussion is on with India about the future of it contingent, but that is a matter between [the UN Department of Peacekeeping Operations] and the government." Video here, from Minute 12:20. Doss is, of course, part of DPKO. In the Congo, Indian soldiers have been accused of sexual abuse and involvement in gold trading, even in returning weapons to rebel groups. A senior Indian peacekeeper was taped praising the now-detained war lord Laurent Nkunda. Congo protested this, and India threatened to leave. After the briefing, off-camera, Inner City Press asked Doss about detailed reports of over 20 rapes in March by the Congolese Army. Yes, Doss said, "they leave them out there for years, without proper barracks, without bases, without support. These things happen. It doesn't excuse it or exonerate it. But.. we can even help build garrisons." Audio here, in .amr format. But when the UN known which Army unit committed the rapes, what does it do? Doss said these rapes were by the 85th Brigade, a unit known to have been in league with the FDLR rebels. So now what happens? These are all test cases for the UN. 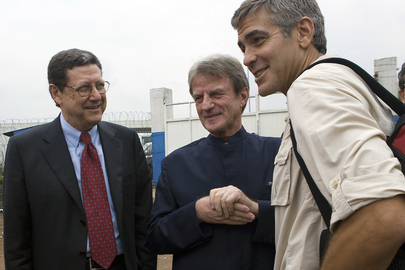 UN's Alan Doss, with Bernard Kouchner and Clooney, "these things happen"
Inner City Press also asked Doss about criticism that during the ill-fated raid on the Lord's Resistance Army in December, MONUC was only told a few hours before the attack began, and thus did not protect civilians butchered by the fleeing LRA. Doss confirmed that MONUC was not involved, then repeated that the UN had only 220 peacekeepers in the area. But might it have had more forces there if it had been told of the raid in advance, at least by its Congolese "partners," to say nothing of the United States, which financed the bungled operation. Now, Doss said, MONUC may belatedly be building sub-bases in the area. If so, maybe then they can try to ascertain who is flying in weapons and supplies, including satellite phones, to the deadly LRA. Doss said he'd heard these reports, but has no way to know or find out if they are true. Yes the country is large, but with 17,000 peacekeepers, something should be able to be known. Or perhaps, as in the botched offensive on the LRA, the U.S. and other countries including France with surveillance capability are not cooperating with MONUC. In a strange cooperation note, Doss confirmed that when the DRC government in 2007 asked MONUC to assist in locking up Nkunda's deputy Bosco on a warrant by the International Criminal Court, then MONUC chief William Lacy Swing said yes. Doss said the request "has not been renewed," adding that MONUC will not work with Bosco, now part of the Congolese army, the FARDC. Inner City Press asked Doss, without answer, how the UN could agree to assist in apprehending an ICC indictee in the Congo, but not for example in Sudan, where president Omar al-Bashir has been indicted. Doss said he would not answer for the UNAMID mission in Darfur. But someone in DPKO or the UN's legal unit should answer this. Perhaps its because the request for Bosco came from a government this is a party to the ICC. But what if the UK or France asked UNAMID to arrest or help arrest Bashir? There are questions that should be answered. Doss to his credit answered several more, including on the $9 billion Congolese "cooperation" agreement with Chinese mining interests -- Doss said that remarks he's heard from "Chinese sources" tell him the deal is on -- and about an attack earlier on Thursday in Uvira, in which ten people were killed and over 200 prisoners freed in an attack by Mai-Mai forces said to be supported by the Burundi-based FNL. Video here from Minute 22:30. Doss said he'd look into it. We'll see -- watch this site.